balance their wares on their heads while weaving between vehicles. There are no traffic lights, so navigating this swirling mob of public buses, SUVs, and motorcycles requires both timing and fortitude. André Eugène and Celeur Jean Herard are founding members of the Atis-Rezistans and participating artists in the Ghetto Biennale. Despite having achieved respectable artistic careers, Eugène and Herard are starkly aware of the disparities confronting artists in the developing world. On more than one occasion, Eugène has been denied a U.S. travel visa to attend viewings of his work in cultural institutions. For these artists, proclamations by elitist art circuits of the so-called “globalized” art world sound bitterly hollow. In 2009, Eugène piloted the Ghetto Biennale in partnership with British photographer Leah Gordon. In one sense, the biennale acts as an introductory agent between Haitian artists— the majority of who cannot afford foreign travel— and the global arts community. 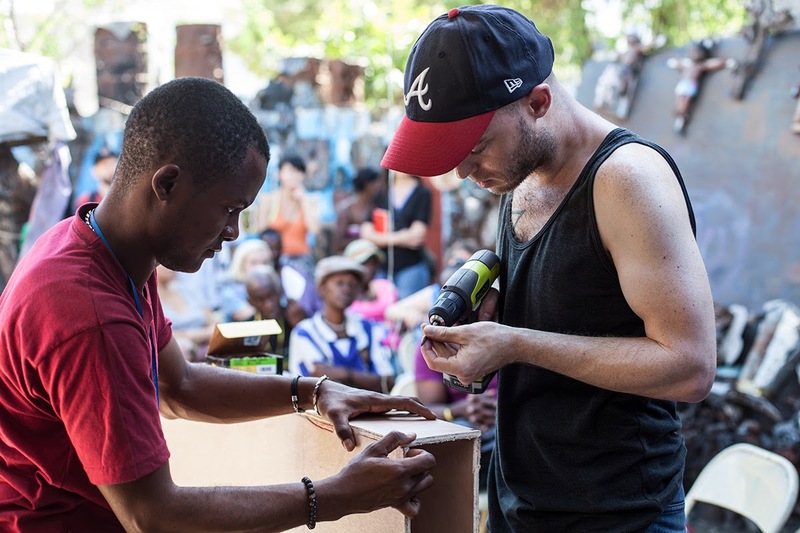 International artists who come to participate are expected to create their projects on site in the Grand Rue neighborhood, relying on the Haitians’ knowledge of local materials and techniques. 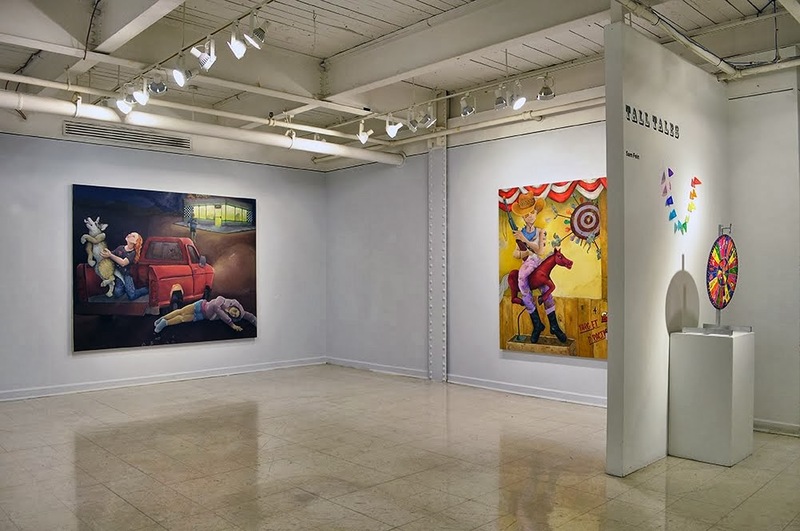 In exchange, the Haitian artists are taught strategies to network and negotiate the international art market. This year, for example, New York-based gallery director Robert Dimin led a workshop demonstrating the “Chelsea standard” of packing and shipping pieces. The Ghetto Biennale is a defiant response to Western media’s construct of Haiti as a nation entrenched in victimhood. The project is ever evolving, cycling through periods of critical reflection and subsequent modification. In 2013, a ban on lens-based media was implemented upon foreigner visitors. The ban sought to reverse the ethnographic gaze (or “othering”) that occurs when the lived experience is mediated through a lens. In a project seeking to reclaim this gaze, Haitian trio Romel Jean Pierre, Racine Polycarpe, and Claudel Casseus took portraits of the international visitors and collaged the images with recycled materials from the Grand Rue area. The Ghetto Biennale is a living and breathing social experiment, a microcosmic shift within the global power structure. Although the biennale does succeed in fostering collaboration between artists from radically different backgrounds, by no means is this process simple or without contention. Class and cultural barriers are not easily hurdled, and participating artists grapple with multiple, oftentimes contradictory, agendas. Such asymmetry is evident in the types of pieces realized during the Ghetto Biennale. While international artists gravitated towards the ephemeral —projects that were site-specific, performative, or relationally rooted— the Haitian artists were clearly producing objects to market and sell. This contrast reflects an unsettling reality: while Western artists have the option to create without monetary ambitions, the Haitian artists are restricted to producing commodities to ensure their survival. Internal contradictions also surfaced, as visiting artists grappled with feelings of guilt and ambivalence regarding their participation. The division between artists from the first and third world was central in iGhetto, a brilliantly conceived project by the Danish collective Wooloo. For this piece, the international artists were asked to display all Apple products they had brought to Haiti in a studio along the Grand Rue. In theory, the piece sought to express the material realities of being a working artist in the global economy. However, on the day of the exposition, only a handful of artists elected to participate. This dismal outcome speaks to the visiting artists’ discomfort in having their electronics exposed in an area with a high concentration of poverty. is a interdisciplinary artist who utilizes the visual form to create works that address contemporary psychosocial issues. She lives and works in New York City. © 2014 Samantha Fein. All rights reserved. Simple theme. Powered by Blogger.